For twenty years, From 1960 through 1980, KOMO-TV in Seattle produced a half-hour program called Exploration Northwest, written and narrated by Don McCune. The Exploration Northwest crew travelled all over the Pacific Northwest, Alaska and western Canada filming adventure stories about topics such as fishing, hunting, camping, outdoor sports, Native American history, ships and sailing, horseback riding, and more. 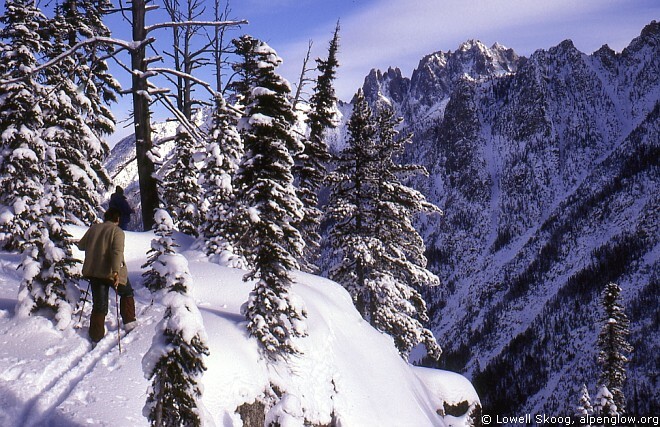 In 1980, Exploration Northwest aired a program called "Backcountry Ski Tour." The show followed four cross-country skiers on a stormy tour around Table Mountain near the Mount Baker Ski Area. The skiers were Eric Lindahl, my brothers Gordy and Carl, and me. During the stormiest part of the trip, the skiers recalled a more pleasant time, skiing across the North Cascades Highway (which was shown in flashback). Here is the story of how these trips and this program came about. Gordy Skoog stops for a picture below Washington Pass. After years of false starts and an intensive construction effort, the North Cascades Highway opened on September 2, 1972 (a week before my 16th birthday). I probably drove over the highway with my parents soon afterward, but I don't remember it. My first memory of crossing the highway was in May 1976, when I made a snowshoe ascent of Silver Star Mountain with Gary Brill, my brother Carl, and two others. We were impressed by the country, and over the next two years I made almost twenty trips along the highway, climbing Liberty Bell Mountain, both Early Winters Spires, Concord Tower, Wamihaspi Peak, Cutthroat, Corteo and Black Peaks, and a new route on Mesahchie Peak. In the mid-1970s, Nordic skiing was a fast growing sport. 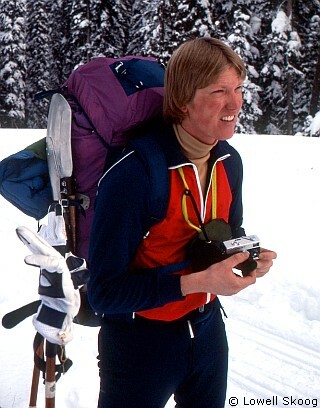 In 1978, Steve Barnett, then living in Mazama, Washington, completed his book Cross Country Downhill. Barnett's book showed how lightweight Nordic gear could be used for downhill skiing in remote backcountry. With my brothers Gordy, Carl and others, I had done some backcountry skiing on edgeless cross-country skis. We had been alpine ski instructors for years and we became interested in backcountry skiing after we started alpine climbing. But we weren't sure how to get into it. Initially, we tried using lightweight Nordic gear because it was inexpensive and we didn't know anybody who used alpine touring gear in those days. Gordy, who had been a freestyle skiing competitor in the mid-1970s, took a job as a sales representative for Skilom cross-country skis. This job kept him busy travelling, and he looked for ways to combine his sales work with a little fun. Somehow, he came up with the idea of skiing across the North Cascades Highway in winter, a distance of about 40 miles. The highway regularly closes between December and April (although it remained open during the drought winter of 1976-77). We hadn't heard of anyone skiing the highway before, and it seemed like a good trip for light cross-country skis. To entice Skilom to give him the time off, Gordy contacted Exploration Northwest about filming the trip. Although there would be no mention of Skilom products in the show, scenes of the skis crossing the North Cascade Highway would be good for business. Approaching Washington Pass from the east. We started the trip on December 18, 1978. Gordy, Carl and I were joined by Frank Ruggiero and Karen Posner, a married couple from the East Coast who we met through rock climbing. Gordy outfitted us with Skilom skis and light touring shoes, and we made our way from Seattle to Sun Mountain Lodge near Winthrop, Washington. We had dinner the night before our departure with Don McCune, host of Exploration Northwest, and Eric Sanford, a recent arrival in the Methow Valley who started Liberty Bell Alpine Tours and launched the first helicopter skiing operation in the Cascades in 1983. The next morning, Eric helped us shuttle our vans to Silver Star Creek, about ten miles west of Mazama at the end of the plowed road. The KOMO-TV crew included cameraman Darrell Benedict, sound-man Fred Boor, and production assistant Chris Raaum. Don McCune, who was about 60 at the time, would not be making the trip with us. The film crew planned to travel using two snowmobiles provided by Lakewood Lawn Supply. We waxed our skis, shouldered 40-lb packs, and followed an existing snowmobile track to Washington Pass. The gradual climb took about five hours. We were aware of the possibility of avalanches below the Early Winters Spires, so we dragged avalanche cords. None of us owned an avalanche transceiver (they were a relatively new invention in 1978) and none of us had ever taken an avalanche course. Carl Skoog at the Washington Pass overlook below Liberty Bell Mountain. The TV crew filmed us skiing toward the pass, but they had difficulty coaxing their snowmobiles through the soft snow. In 1978, snowmobiles were smaller and much less powerful than they are today. After unloading their sleds at Washington Pass, the crew continued to Rainy Pass to evaluate snow conditions. We dug a snow cave at Washington Pass to spend the night. The early season snow was shallow and unconsolidated. During the night the ceiling of our snow cave sagged so badly that we had to knock it down and erect a rain fly, our backup shelter. The night was very cold. In the morning, our skis left out in the snow were coated with delicate frost feathers. After discussing the situation, the Exploration Northwest crew decided that the snow was too soft for them to complete the trip. Their overburdened snow machines were wallowing in the deep snow. Since it was a beautiful morning, they made the most of it by filming us skiing to the Washington Pass overlook. Then they loaded the sleds and headed back down the trail to our starting point. Eager to continue the trip, we skiers were now on our own. We said goodbye to the film crew, packed up and skied west to Rainy Pass. We continued on a packed trail to Swamp Creek and camped after travelling just three hours. Gordy built an igloo while the rest of us pitched rain flies over trenches dug in the snow. The night was cloudy and much warmer than the previous night. On the third day our packed trail ended about a mile beyond Swamp Creek. We soon realized how spoiled we had been up to that point. We broke trail on our skinny skis for 13 long miles to the Granite Creek Guard Station, near the junction of Granite and Canyon Creeks, where we camped. Although it was downhill all the way, we couldn't glide at all. It rained during the night and there was too little snow for a snow shelter. We slept under our rain flys in the open air. On the fourth and final day, the rain stopped, but the snow was wet and our skis gripped poorly. We skied on the thinly covered road to the Ross Dam parking lot, where the road was plowed. From that point, we alternately walked the road or skied the highway shoulder, whichever was easiest. Above Diablo Lake, the road began a steep descent and we glided quickly down the last two miles to the Colonial Creek campground. Frank's camper was waiting there. It had been an interesting and enjoyable trip, but the TV crew had not obtained enough film to complete their program. 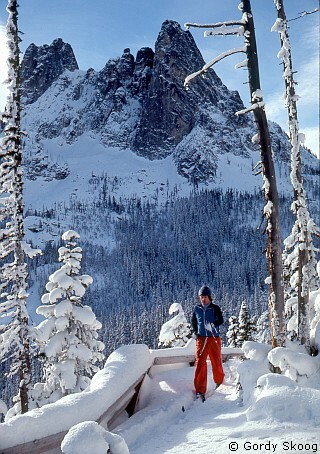 Lowell skis along the North Cascades highway below Beebe Mountain. 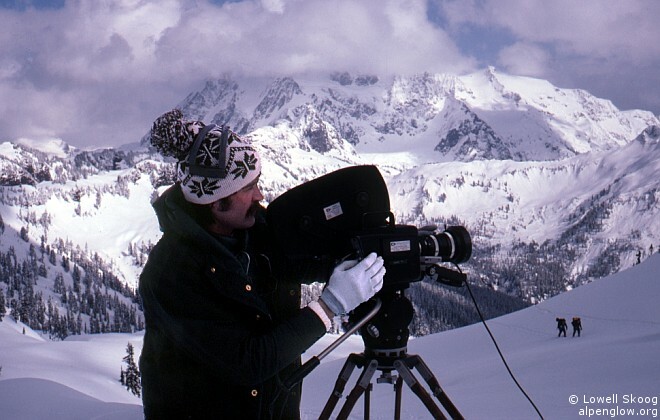 Gordy made arrangements with KOMO-TV for a followup trip to the Mount Baker ski area on March 31, 1979. With broken clouds and sun breaks, Gordy, Carl and I toured with long-time friend Eric Lindahl from the ski area to Artist Point. We traversed the south slopes of Table Mountain to a camp at the Ptarmigan Ridge saddle. Afternoon sun released a pair of small avalanches that crossed our tracks after we traversed Table Mountain. The KOMO-TV crew (Darrell, Fred and Chris) were rattled by this and Darrell labeled his first reel of exposed film: "Mount Baker Death Ski." Most of the filming took place around camp, showing us building an igloo and cooking inside. Eric's sense of humor was a boon for the TV crew, who would otherwise have had to coax entertaining banter out of the Skoog brothers -- not an easy task. A storm blew in overnight and we had to beat our way out the next day. Fog and snow produced whiteout conditions and vertigo as we traversed back toward Artist Point. We dropped low beneath Table Mountain to avoid the avalanche slopes we had crossed the previous day. Climbing back to Artist Point in deep snow on skinny, waxed cross-country skis was hard work. Without snowmobiles on this trip, the film crew had to ski as well. The most pathetic movie footage (which Darrell Benedict seemed to film with relish) was of sound-man Fred Boor, who suffered many face plants on the return trip and arrived at the cars completely knackered. Once again, the trip ended without enough film for a complete show. After looking at the footage from both trips, the KOMO-TV team devised a way to connect the Mount Baker and North Cascades stories through a flashback. Gordy and Carl went back to Mount Baker one more time with the production crew to film a connecting sequence. The program aired in the winter of 1980. As I recall, the show won an Emmy award for the soundtrack, which included original music ("Beyond Table Mountain") by Mark Utting. 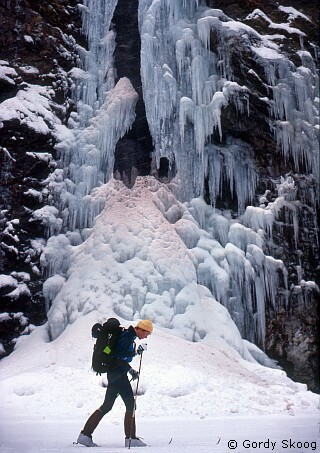 Later that year, we filmed another Exploration Northwest program called "Goldenhorn Pinnacle". These trips were the beginning of the end of backcountry skiing on lightweight Nordic equipment for me. Two weeks after our Table Mountain outing, I made my first trip on alpine touring equipment up Silver Star Mountain. After that I never looked back. 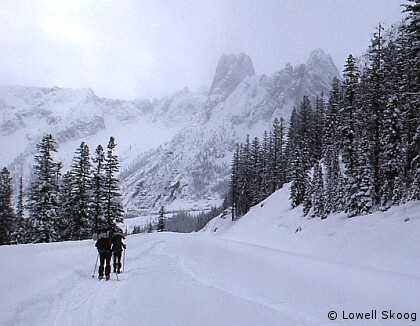 In 2003, just before the North Cascades Highway opened for the spring, Gordy skied across the highway on lightweight skating skis, solo, on two consecutive days (east the first day, west the second day). His east-to-west crossing took him just four hours. "Backcountry Ski Tour" - Executive Producer: Patrick Scott. Producer: Joel Schroedel. Written and Narrated by Don McCune. Photographed by Darrell Benedict and Joel Schroedel. Edited by Darrell Benedict. Production Assistant: Chris Raaum. A production of KOMO-TV. © 1980, Fisher Broadcasting Inc. Copies of this program can be purchased on DVD from The Don McCune Library. Darrell Benedict films skiers near Table Mountain with Mount Shuksan in the background.